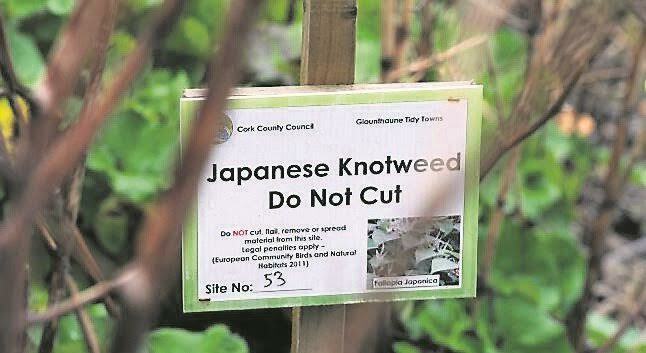 Awareness is growing in Donegal regarding the dangers and threat of Japanese Knotweed to houses and sites. The presence of knotweed on site makes a property virtually unsaleable, and purchasers are warned to ensure their house purchase survey checks for the presence of knotweed on site or in the immediate vicinity of your property. The cost of removal can be upwards of €10,000 per quarter acre, over a four year period. Left untreated it will penetrate the foundations of buildings, concrete, tarmac and walls and its vigorous growth can cause subsidence. It can penetrate the smallest opening above, or below, ground and will cause walls and kerbs to tilt, or crack. It can emerge through six inches of tarmac. It also crowds out all other competition from other shrubs and plants in its environment. It can be spread unintentionally from a site, which was being cleared, to another site, due to fragments being moved on the wheels of, possibly, a JCB. It can also be spread under a road from one site to another. Once it takes root, it just takes off and the most common method of infestation is through contaminated soil being moved from one place to another. The plant has a rhizome (stem-like) root which is extremely aggressive and can travel up to seven metres horizontally underground in a year. It can grow up to four metres vertically each growing season. A tiny fragment of a rhizome, or stem, immersed in water, can produce a viable plant within seven days.The worst thing anyone can do is to cut back, or trim, the knotweed as such action only spreads the weed further. It should not be composted and, even if it is buried, it can come alive after being dormant for many years. 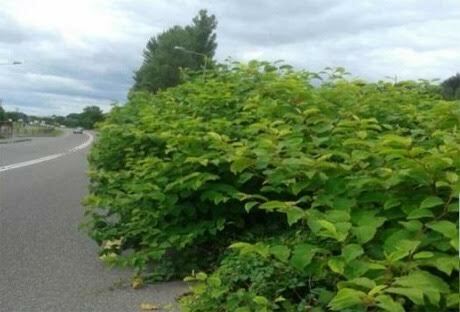 Last year Donegal County Council announced a four-year Invasive Alien Plant Species (IAPS) treatment programme on public roads. The circa €200,000 project follows a pilot initiative in the county in 2015 to trial different treatment options for the eradication of invasive plants such as Japanese Knotweed and Himalayan Knotweed. Signs are visible in affected areas identifying the plant to deter cutting. Donegal County Council senior engineer Brendan O’Donnell said: “Current treatment practices include spraying with herbicide, foliage removal and stem injection, stem injection and excavation and deep burial.When treating with pesticide the timing of treatment is critical, as is the pesticide to be used “. Late in the season just before the plant dies back for the winter appears to be the most effective.” Donegal’s national roads will be among the first treated by Transport Infrastructure Ireland (TII) this year.